Best lil fesfser in town. 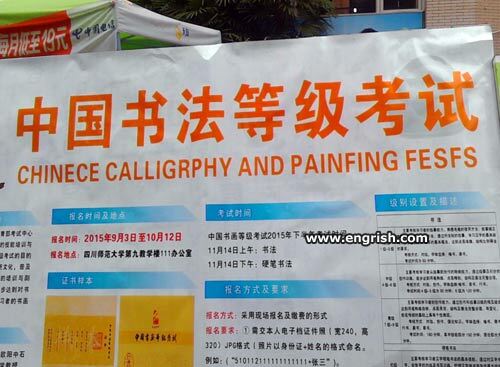 calligrphy: How to painfing fesfs in the chinece languge. This engrish is painfing to re[a]d.
The calligrphy is fine by me but I’ll pass on the pain fing. I don’t want to suffer for my art! I wonder if the Chinephew does it the same way. Signs like these really fesf my pafience! Trying to read this is a real pain in the fesfes. Using Chinese paintbrush to write perfect Engrish will lead to mental illness. I could never spell callingagroffeacagrfurry. So I invented the word “printing”. @jjhitt. The have a 3D Printer for printing faeces. In my day w used to buy plastic chunders, and dog turds, at the novelty shops. Whoever is responsible for prinfing this sign, fesf up! It’s so hard to find good FESFS these days. I bought a Chinese paintbrush recently. All the effen bristles fell out. Now I am incommunicado, and when I get out of it, I will demand a fesfund. Well… at least they spelled “AND” right. I have painfing in my fesfs…need bloated flatulence cure! Fesf tee is titfeen dollars. Snack in the ‘tuck’ shop atfer fhe fest, anybody?